National format lineup cards are often used during tournaments, inter-region play, and Fall/Spring season. 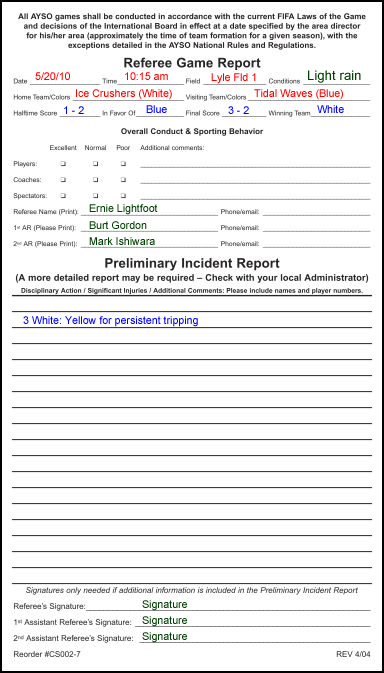 There is a pdf template for filling in the front page of the lineup card which you then print on card stock or on regular paper. Download a copy of the lineup card. Fill in region, age group, team number and game date. Fill in your team name and opponent name. Fill in your entire roster, ordered by jersey number. Write "sick" or "absent" next to player's name if they are not in attendance. Fill in game date and time. Fill in your team name and colors and opponent name and colors. Record who is playing keeper with a "G"
Record substitutes i.e. those not playing with an "X"